Morecambe is a seaside resort in Lancashire between Blackpool and the Lake District. 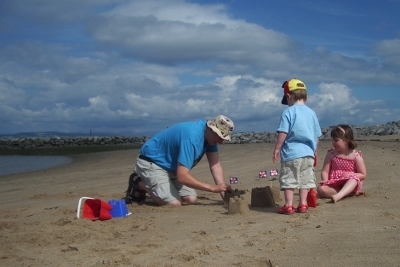 We visited Morecambe recently during our family holiday at Heysham Ocean Edge caravan site. On the first day we visited, as we first entered Morecambe it looked like a seaside resort that has closed down. The Frontierland theme park is now a wasteland with the Polo tower and the old frontage on some shops being all that’s left. We entered Morecambe in the West Bay. There is a shopping centre and supermarket, free on-road parking and the beach is arguably better than the east bay (less muddy towards the sea). Fortunately the east bay (few minutes walks) is in a better state. The west bay is also showing signs of decay in the condition of the former Midland Hotel and the site where Bubbles used to be located, but elsewhere there is a modern children’s playground, amusement arcades and seafront shops and cafés. 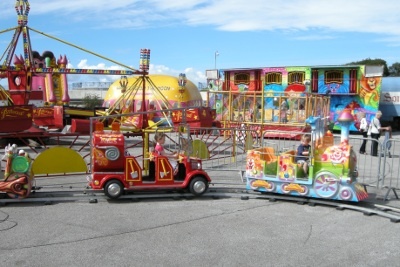 There is also a temporary fun-fair on part of the former Bubbles site. It’s only a tiny fraction of the size that Frontier land used to be, but there are sufficient rides to satisfy young children and it is reasonably priced (to get best value for money buy the sheet of ride tickets rather than the tokens). The beach at the east bay is more popular and has finer sand at the top of the beach. Unfortunately as you venture further down the beach and into the sea the ground is very muddy. The west bay has a more coarse sand, but the sand extends further into the sea without the mud that is at the other bay. The tide goes out a long way on both beaches, but comes in and goes out very quickly, but remains relatively shallow for some distance when the tide is in. Whilst generally okay for paddling venturing further into the sea is considered particularly dangerous due to rip currents, soft-sand and mud and is notorious for the tragic deaths of cockle pickers and others that have been caught by the tides (BBC News: Deadly sands of Morecambe Bay). 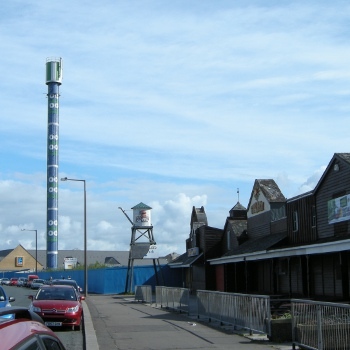 Free on-road parking is available in the west bay, but when visiting the east bay car parking is available on seafront car parks (these may get relocated in future depending upon future regeneration programmes) which are reasonably priced. There are usually spaces at the car park by the RNLI inshore lifeboat station. There are toilets and baby changing by the clock tower, with a small charge. Morecambe has certainly seen better days. During the 80s it was a very popular holiday destination, but as with so many British seaside resorts it has suffered from the exodus of holiday makers seeking warming destinations or the bigger thrills of nearby Blackpool. The west bay has suffered the worst, but has seen some development in terms of a retail park. The east bay has a number of areas that are badly in need of redevelopment / investment, but is still worth a visit. There is plenty to do for young children. This entry was posted on Friday, September 24th, 2010 and is filed under Babies, Children, Days Out, Family, General, Holiday, Tourism. You can follow any responses to this entry through the RSS 2.0 feed. Both comments and pings are currently closed.